The Heidelberg Catechism expounds upon the Ten Commandments uniquely by demonstrating how they encompass every area of moral living. Even the tenth commandment, which we’ll study today, relates to the whole law by stating “that not even the slightest thought or desire contrary to any one of God’s commandments should ever arise in my heart.” Such an interpretation is devastating because it condemns every one of us. But Lord’s Day 44 digs deeper than the mere prohibition of this commandment by asking and answering a difficult question: Why do the Ten Commandments still matter if we can’t obey them perfectly? As always, the answer points to the glory of our gracious God. and take pleasure in whatever is right. have only a small beginning of this obedience. for forgiveness of sins and righteousness. “In this life even the holiest have only a small beginning of this obedience.” Let’s be honest: the Catechism’s analysis of the Ten Commandments can be profoundly disturbing. Can anyone fulfill the expectations of God’s law? Even as we understand that we are saved by grace, not by works, what kind of obedience does Christ expect of us? Thankfully, the answer the Catechism provides rests in God, not in us. The Ten Commandments, it says, are to be preached so pointedly “so that the longer we live the more we may come to know our sinfulness and the more eagerly look to Christ for forgiveness of sins and righteousness.” And, as the end of Psalm 79 reminds us, God will not remember those sins against us. And take away our shame. The Ten Commandments bring us face-to-face with the spiritual battle each of us must fight. Our sinful natures have been conquered, but they have not yet been annihilated. The Christian life is a constant struggle against vicious enemies on every side, including our own fallen flesh. But we serve a gracious Savior who “will redeem Israel from all his iniquities,” as Psalm 130 teaches. “The sting of death is sin, and the power of sin is the law. But thanks be to God, who gives us the victory through our Lord Jesus Christ” (I Cor. 15:56, 57). And to my help draw nigh. Once again we turn to the Ten Commandments and their treatment in the Heidelberg Catechism for the next installment in our nearly-complete URC Psalmody series. Today’s focus is the ninth commandment (via Lord’s Day 43), which concerns false testimony against our neighbors. and they would call down on me God’s intense anger. to guard and advance my neighbor’s good name. “God’s will is that I never give false testimony against anyone, twist no one’s words, not gossip or slander, nor join in condemning anyone without a hearing or without a just cause.” Although the imprecatory psalms do call for God’s judgment on the wicked, often their primary motive is to emphasize the danger of sin itself. Psalm 12 concerns itself, as the Psalter Hymnal puts it, with “flattering lips” and “boasting mouths” that spew forth lies. In contrast to these rebellious liars, the psalmist praises the Lord for his “pure words” (v. 6, ESV), and reassures himself that “you will guard us from this generation forever” (v. 7). False gratitude and treacherous thanks. Who is this God? We shall abide! His word of truth shall be obeyed. Though rogues are honored far and wide. “Lying and deceit of every kind…are devices the devil himself uses, and they would call down on me God’s intense anger.” In Psalm 35 David laments the affliction he has undergone from those who bear false witness against him, but he looks expectantly to the Lord for justice and salvation. They overwhelm my soul with grief. And strive that I may be o’erthrown. O Lord, how long wilt Thou delay? Amid the crowds that throng Thy gates. To trouble those that peaceful be. 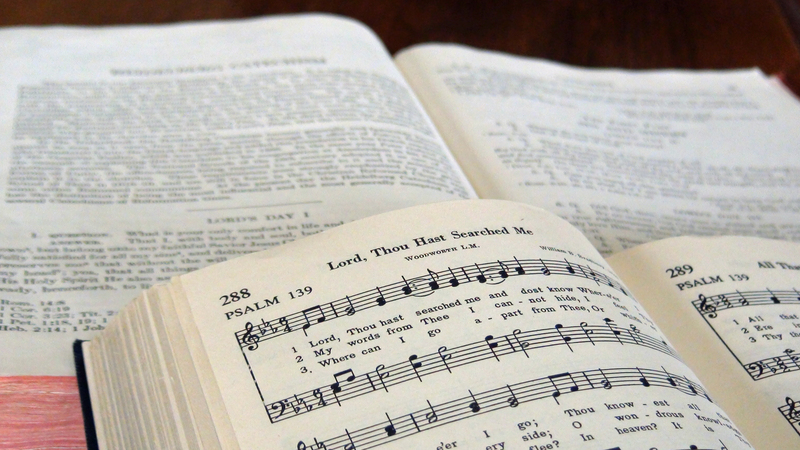 “I should love the truth, speak it candidly, and openly acknowledge it.” Grave judgment lies in store for those who love “evil more than good,” according to the Psalter Hymnal’s versification of Psalm 52. In Christ’s words, “out of the abundance of the heart the mouth speaks. The good person out of his good treasure brings forth good, and the evil person out of his evil treasure brings forth evil” (Matt. 12:34, 35). As Lord’s Day 42 of the Heidelberg Catechism shows, the eighth commandment has to do with so much more than just the crime of stealing. The concepts of selflessness, generosity, and good stewardship are all present in the exposition of this command. Today in URC Psalmody’s continuing series we consider the words of this Lord’s Day. or any means forbidden by God. The heavens and the earth they assume to possess. “In addition he forbids all greed and pointless squandering of his gifts.” Psalm 82 is a bold declaration of God’s wrath against men who use their power for selfish gain rather than benevolence. God owns the very peoples themselves (stanza 3); how much more their puny stashes of wealth! Of them of ill repute? From those who would distress. And perish by My rod. The peoples Thou shalt own. “That I do whatever I can for my neighbor’s good.” In Psalm 7 David applies this principle even to his enemies, but laments that even these attempts at kindness have been returned with continued hatred. However, he remains confident that the Lord will judge “all nations of men” and reward those who are “faithful and righteous in life.” With New Testament eyes, we can add that God counts us among his faithful ones because of the work of Christ, even though all of us have broken the eighth commandment in some way. My life and mine honor in dust let him lay. For God, who is just, tries the thoughts of the heart. “[T]hat I work faithfully so that I may share with those in need.” Psalm 37, a poem of wisdom, has much to say about the difference between the righteous and the wicked as it relates to the eighth commandment. Even though earthly minds balk at the thought of using one’s wealth for the benefit of the poor, the Christian, recognizing that all of his riches are a gift from God, is ready and willing to share with those in need. “And your Father who sees in secret will reward you” (Matt. 6:4). Like smoke they fade away. They shall possess the land. Lord’s Day 41, the subject of today’s post in URC Psalmody’s Heidelberg Catechism series, reveals God’s will for the Christian’s life as it relates to the seventh commandment. A. God condemns all unchastity. live decent and chaste lives. whether it be actions, looks, talk, thoughts, or desires. “We should therefore thoroughly detest it.” The negative example for the believer to heed and avoid is that of the hardened sinner. Psalm 10 describes the actions and attitude of the wicked man, who has set himself so firmly against God that his laws are “too high for him to see.” In a culture where unchastity and promiscuity are becoming less and less scandalous, the Christian’s first step must be to align himself with the eternal truth of God’s law. The sovereign God to hear. “We are temples of the Holy Spirit, body and soul, and God wants both to be kept clean and holy.” The Christian, realizing that both his body and soul are set apart for God’s service, ought joyfully to resist any adulterous defilements of the world, clinging instead to his faithful Savior and Lord. The battle against sin may not be easy, but our victory in Christ is sure. Psalm 45 emphasizes the intimacy between Jesus and the people he has bought with his own blood—a story of redemption that is indeed “a goodly theme,” a joyful song. As I salute the King. Their precious gifts will bring. His bride He loveth well. As princes of the earth.